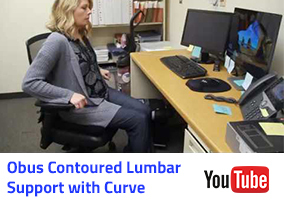 Check out these videos highlighting Computer Access & Ergonomics devices that are available to loan from ABLE Tech! What is Computer Access? It is Assistive Technology (AT) available to students requiring alternative methods to use a computer. It can be input and output devices, alternative access aids, modified or alternative keyboards, switches, special software, and other devices and software solutions that enable students to use the classroom computer. Ergonomics is a term often used to generally describe the science and practice of designing jobs, tools, equipment and environments to match the capabilities and limitations of the human body. Typically, ergonomics is focused on the workplace but ergonomics can also be applied to students, helping with computer access and computer workstation set up, backpack design and use, as well as students’ after-school jobs. The AT chosen opens the door of opportunities. When do I need to use AT for Computer Access? AT may be needed after gathering information about the student’s abilities, goals and specific tasks. Students may need computer access all day or just for certain tasks like reading text, taking a test, and writing papers. Who needs Computer Access AT? Any student struggling with the three functional barriers: 1) providing computer input 2) interpreting output, and 3) reading supporting documentation. Students with motor, visual, cognitive or learning disabilities all can benefit from hardware and software AT. Why aren’t computers more accessible? Too often, people think of accessibility as an add-on to a device or program. Increasingly today, developers and designers are realizing that maintenance becomes easier when accessibility is part of the basic design. Now, many smartphones, tablets and computers also include screen readers and speech recognition. Or, create a heavy cardboard mask by itself or over a plastic keyguard. This student is a senior in high school, 17 years old and survived a skiing accident but broke his third and fourth vertebrae. As a quadriplegic, he is now a wheelchair user. He has retained good head and trunk control and can move his right arm minimally from the shoulder. He has good movement in his thumb, index finger and second finger of his right hand. He is very motivated to complete his regular high school program and get back to his after school job. Click to find more Computers & Related devices in ABLE Tech Inventory. Q - May I ask for an accommodation during the interview process? A - Yes. Employers are required to provide "reasonable accommodation" -- appropriate changes and adjustments -- to enable you to be considered for a job opening. Q - How do I request a reasonable accommodation? A - You must inform the employer that you need some sort of change or adjustment orally or in writing. Q - How can I get more information about the ADA? A - You can obtain more information about the ADA and its requirements through EEOC's website, www.eeoc.gov. Consider the built in accessibility – built in features allow you can use the computer without added on assistive technology. 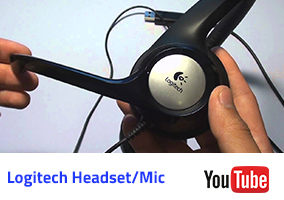 There is speech to text dictation, magnification, text to speech narration, onscreen keyboard, mouse settings all built in all computers, tablets and phones. Keyboard commands make software more accessible to all. Some people simply prefer using the keyboard instead of the mouse. For others who may have difficulty using the mouse, key commands offer an alternative control method. They are very helpful for employees who are trying to navigate software and the internet and for customization activities. Can’t access a “regular” keyboard, an employee may benefit from an onscreen keyboard. It is important to consider the physical layout or organization of the keys when selecting alternate keyboards. If an add-on keyboard besides onscreen is deemed necessary there are many choices of keyboards. They make large keys, color coded, and different layout keyboards. There are also smaller keyboards for small fingers or even a one handed typist. Adult with Multiple Sclerosis (MS) uses a wheelchair and workstation accommodation. A resource nurse with MS was having difficulty accessing her workstation. She needs to be able to adjust her workstation for different clerical tasks and be able to move around as freely as possible. She spends most of her day at her desk helping customers. Widening the floor space in the workstation will allow easier access for the nurse and her wheelchair. 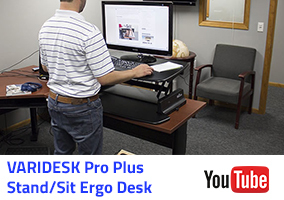 An adjustable keyboard tray and a standing desk could be added to the workstation to allow the ability to adjust positions whether in the wheelchair or standing. Placing a document stand next to her computer to help with data entry. An ergonomic mouse and ergonomic keyboard will also reduce fatigue. In addition, she could be provided a flexible schedule so she could continue her medical treatment. Employee will have the ability to sit and stand as needed throughout the day. She will be able to complete tasks in a timely manner without as much fatigue having most of her needed resources in close proximity to her. Adult worker with bipolar disorder is having memory loss and reduced concentration. An employee working for a printing company is having concentration and memory issues related to mental illness. He needs to be able to take notes, make lists, set reminders and develop strategies to help with needs that arise. We would start by addressing his need for technology to assist in the situation. An iPad would be helpful to create a to do list, set reminders, take notes, create white noise with an app, and use the voice recognition feature to capture on the go notes. Other devices could be added to assist in keeping his production level high. Employee will develop strategies to reduce distractions and complete job responsibilities with assistive technology. He will learn to use an iPad daily. Setting reminders will help keep him on track and taking notes will help keep him organized and not lose focus as much. Adult with severe hand malformation using alternative input device. A new graduate has received a receptionist position and needing alternative computer input access. His left hand functions well and needs to find the best keyboarding solution. He spends most of his day at the computer entering appointments and answering emails. The employee can start by trying a smaller keyboard that allows less movement of the hand and more control. Keys are closely spaced for easy access, and the keyboard surface is very sensitive to touch. If that is not helpful he can try one-handed typing. One-handed keyboard keys are placed differently than a standard keyboard and can make data entry easier. After an alternative keyboard is selected, the workstation will be adjusted to position the keyboard for comfort. Employee will have a natural, comfortable alternative keyboard for data entry. He will also be able to use the computer throughout the day with less fatigue. The Purpose- What does the person need to accomplish with computer Access. Is this a long term or short term solution for computer use at home?